Let justice roll on like a river, righteousness like a never-failing stream. 1: The words of Amos, who was among the herdsmen of Tekoa, which he saw concerning Israel in the days of Uzziah king of Judah, and in the days of Jeroboam the son of Joash king of Israel, two years before the earthquake. Amos was the first of the writing prophets. He focused on the northern Kingdom of Israel which would soon be conquered by the Assyrians; her peoples (the ten tribes) carried away. He can also be at least partially credited for introducing a Seismic Theophany motif into Hebrew literature (Austin et. al., 2000). Seismic Theophany is the belief that God acts through earthquakes (among other things). After Amos, eschatological (i.e. end time) prophecies frequently included earthquakes and it is possible that some of the subsequent descriptions of the “prophetic” earthquakes described in the Tanakh echo reports of the effects of the ~750 BC Amos Quake. 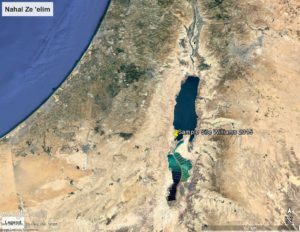 The Amos Quake may be part of an earthquake couplet – a pattern in Dead Sea earthquake chronology where northern and southern earthquakes occur within a relatively short time span (geologically speaking) of each other (Kagan et. al, 2011). This appears to have happened in the earthquakes of 1202 and 1212 AD, May 18 and May 19 363 AD, 31 BC (Josephus Quake) and ~31 AD (Jerusalem Quake) and possibly the Amos quake(s). The couplets are due to something that we Earthquake Geologists call “accomodation”, When one part of a major fault slips during a large earthquake, it puts stress on the adjacent part of the fault to also slip – to accomodate the previous slippage. So, for example, if the Arabian side of the Jericho fault (just north of the Dead Sea) lurches forward about 3 meters during the 31 BC Josephus earthquake, this produces a stress on the Arava fault just south of the Dead Sea to also lurch forward – which it did in ~31 AD during the Jerusalem Quake. The Jerusalem Quake accomodated the strain imposed by the Josephus Quake. In the outcrop at Nahal Ze ‘elim (below), one can observe two possible candidates for the Amos Quake where the sample containers mark the lower (earlier) and upper (later) candidates for the Amos Quake. 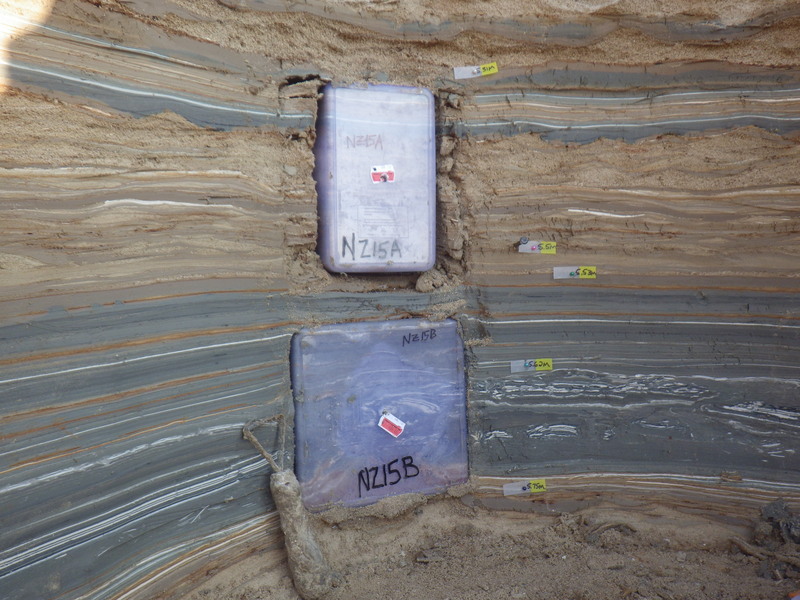 Sampling Top and Bottom Amos Quake(s) at Nahal Ze ‘elim. photo by J.Williams in 2015. Click on image to see a higher resolution version in a new tab. Use the magnifying glass in the subsequent tab to examine image details. Because the Amos Quake occurred during a time period known as the Hallstatt Plateau, it is difficult to date and determine which of the two seismites above is the northern Amos quake and which is the southern earthquake. The Hallstatt plateau refers to a consistently flat area on graphs that plot radiocarbon dating against calendar dates. Radiocarbon dates of around 2450 BP (Before Present) always calibrate to ca. 800-400 BC, no matter the measurement precision (wikipedia). Thus, absent an expensive wiggle matching study or some other technique (e.g. seasonality through palynology), we don’t know which of the two earthquakes in the image above is the one described in the Book of Amos. In addition to the Geologic evidence for the Amos Quake(s), there is also extensive archeoseismic evidence. Damage from the two earthquakes have been interpreted from excavations at Hazor, Gezer, and Deir’ Alla in the north and Lachish, Tell Judeideh, and ‘En Haseva in the south. It is assumed that the earthquake mentioned in the Book of Amos was the northern quake that produced damage in the more populous northern part of Judea and Samaria. If you found this mildly interesting, you should read Geology of the Exodus because this is when the Tanakh (Old Testament) gets really interesting. Mosaic of section in Nahal Ze ‘elim containing the Amos Quake seismite(s). The upper (later) one is just below 5.31 m and lower (earlier) one is just below 5.62 m. Distortion of the image (warping to the left) is an artefact of the mosaicing software. Photo by J. Williams in 2015. Click on image to see a higher resolution version in a new tab. Use the magnifying glass in the subsequent tab to examine image details. Ambraseys, N. (2009). Earthquakes in the Mediterranean and Middle East: a multidisciplinary study of seismicity up to 1900. Cambridge, UK, Cambridge University Press. Austin, S. A., et al. (2000). “Amos’s Earthquake: An Extraordinary Middle East Seismic Event of 750 B.C.” International Geology Review 42(7): 657-671. Freedman, D.N., and A. Welch. 1994. Amos’s earthquake and Israelite prophecy. In Coogan, M.D., J. C. Exum, and L. E. Stager, eds., Scripture and other artifacts: essays on the Bible, and archaeology in honor of Philip J. King. Louisville, KY: Westminster John Knox, 188-198. Kagan, E., et al. (2011). “Intrabasin paleoearthquake and quiescence correlation of the late Holocene Dead Sea.” Journal of Geophysical Research 116(B4): B04311. Outcrop location where Amos Quake samples were taken. Samples were taken from top cutout in section labelled Bottom Left. Photo by J. Williams in 2015. Click on image to see a higher resolution version in a new tab. Use the magnifying glass in the subsequent tab to examine image details. Nahal Ze ‘elim outcrop location. Click on image to see a higher resolution version in a new tab. Use the magnifying glass in the subsequent tab to examine image details.